Contents of Festivale Reel Life and Technology Bytes, Pictorial Guide to Melbourne and Victoria. Cats, art, and food - this is the matrix of The Cat Who mysteries. Chinese mysteries, Japanese Kabuki, and Gilbert and Sullivan all include larger than life characters whose essences have scented the books of Lilian Jackson Braun. Judge Dee was a Chinese judge that solved mysteries, living on today in the translations and stories of Robert Van Gulik (1910 - 1967). The Japanese have their Mr. Moto, but they also have the Happy Cat icon of good luck, seen in restaurants. However, Gilbert and Sullivan lent characters from The Mikado to a pair of detective cats for Lilian Jackson Braun. Coming full circle, this catly business points to a celebrated Chinese artist. 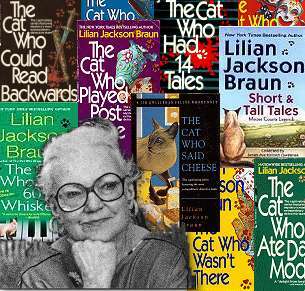 I admire Ms Braun for connecting Chinese art and Siamese cats with Japanese inspired light opera and the spirit of the Happy Cat twirling around the ankles of the Food Section of her fictional newspaper - and for honoring the spirit of a lost cat for some 45 years. Chinese artist Kao K'o Kung operated the ministry of employment in ancient China under the Mongol reign. He moved to Peking, then on to Hangchow. As Supervisor of the Ministry of Occupations at age 28 and head of the Ministry of Justice until he was 62, he was experienced in the world of crime as well as work. He also did some painting. At wine-drinking parties, he painted scenes from the celebrations, but usually refrained from signing his work, leaving mysterious artwork behind. Even so, he was one of Four Masters of the Early Yuan Period, along with Chao Meng-fu, Shang Ch'i, and Li K'an. Kao K'o-Kung perfected monochromatic Chinese landscapes and bamboo scenes, becoming expert at creating a rainbow of shades from a single color. Mountains in mysterious fogs and rain were a favorite of his, bringing to mind the Great Smoky Mountains near Ms Braun's Carolina home. The art world and the laity all called Kao K'o Kung the highest master of the genre. And so, the Good Living Editor Emeritus of the Detroit Free Press who covered Chinese Period Art, chose "Kao K'o Kung" for the name of a now-famous cat with extra whiskers and second sight. The Chinese artist helped to create The Cat Who Mysteries of 1966 - 2008. In her early marriage, Ms Braun wrote a short story to work through the death of her pet cat Koko, also named for the artist. It is found in a few cat story collections under the titles of either The Sin of Madam Phloi and The Revenge of Madam Phloi. In a high-rise apartment building, a Siamese mother cat, Madam Phloi, tends to her male kitten. However, a fat, ugly male neighbor hates cats and takes the first opportunity to pushes the kitten off the high window ledge. Madam Phloi waits for her own moment and manipulates the killer onto the ledge to meet his consequence. The result is like a Chinese death blow that leaves no mark. Koko the kitten became the literary Kao K'o-Kung the cat detective with 60 whiskers and a newspaperman partner with an oversized mustache - James Mackintosh "Qwill" Qwilleran. Yum Yum, a small female Siamese joins to become a trio of volunteer private investigators (PIs). Early in the series, recovering from alcoholism, poverty, and the death of his ex-wife in a mental institution, Qwill suddenly inherits a fortune from his mom's best friend in Pickax City, Michigan - 400 Miles North of Everywhere. Overwhelmed, he sets up a foundation to prosper the county and settles in with his cats, moving every year or so to more interesting digs, mysteries always following as Koko alerts him to clues before and after crimes happen. The Cat Who Could Read Backwards appeared in 1966. I discovered it late in 2003 and have read it four times. Three murders were solved in that first novel, a period piece about Detroit and northern Michigan and their colorful characters. The characters seem real, many based in composites of actual people: newspaper people (no Internet), students, artists, cooks, Hippies, framers, antique and junk shop owners, all sorts. There is some blood and several late night "accidents", but not much gore - enough to be interesting, but not enough to numb the reader. Having given up almost entirely on women, Qwill does not indulge in sexual conquests, but has a series of more subtle romantic interests that leaves one's imagination to work as it will. Koko and Yum Yum have each other and even though both are "fixed", they flirt and chase. As a professional editor and reporter, Ms Braun has refrained from much profanity for her stories. Mysteries that are laden with it make one feel as if hammered by the end of the books. It's not necessary. Ms Braun's books were written on yellow legal pads in pencil, just as Qwill writes his columns on art, food, decor, and human interest in the Daily Fluxion and Moose County Something. He continually plans to write another book, which he never seems to tackle. Ms Braun lived this out in her last novel, never published after two years; but at the age of 97, this is understandable. The Cat Who series provides both intriguing and comfortable types of characters that are also found in some companion pieces such as a collection of short stories, a set of legends, a small group of cookbooks, and similar. Ms Braun has incorporated regional legends, art critique and opinion, antique provenance, puzzles, and coincidences that engage the reader. While many say that these are "old lady" books without having read any of them, they would be incorrect. A famous wide-ranging fire in which a man must choose between which of his two children he can save is not a "cozy" piece of experience. Readers can access the The Cat Who Companion concordance to help select the most exciting stories. Qwill is a former crime correspondent who has survived alcoholism and a mad marriage with the realization that he needs to find work again. An expert in crime reporting and criminology he takes a job with what seems to be a Detroit-area newspaper, but assigned in turn to Arts and Fine Living, as well as Food. It's an education. Qwill has no family, but finds his childhood friend from Chicago as the Features Editor at the Daily Fluxion (presumably the Detroit Free Press). Jim learns about criticism and the odd Fluxion art critic with one hand and the critic's strange Siamese cat in a house that looks like the set of The Addams Family TV program. Interestingly, the show was broadcast at the time of the novel's writing. Jim, going by the nickname of Q. or Mr. Q quite often, finally moves into an apartment in the home of the odd citric, Mr. George Bonifield Mountclemens III, and learns about the astounding but changeable Kao K'o Kung, whom he calls Koko. The Siamese waits for the daily paper and places his nose on each headline and sentence, seeming to read each one, moving it from right to left in the Chinese fashion, until he is done with the paper. No one may have it until he is finished. The underworld of fine arts pokes its head up from the sewer in this novel repeatedly. We see counterfeit art and critics, phantom artists, and murder in the name of art and money. We also are presented an entertaining 1960s "Happening." It is a participation event and performance art within a large warehouse party, almost like a gentler rave. It includes monster statues, confetti, umbrellas, streamers, balloons, rock music, and other materials for party-goers to release, throw, fall onto - and be murdered by. Murders also occur at a high-end retail art store and gallery. A strange half-painting of a monkey is stolen. If the other half could be found, the complete work would be priceless. Who knows where it is? Another murder occurs on the winter patio of the Mountclemens Family but Qwill does not see. Koko howls like a Kabuki banshee at the moment of death and finally leads Jim to the body. With nowhere to go, Koko is adopted by Jim Qwilleran and a lifetime of detecting begins. In the next novel, Yum Yum is a tiny Siamese kitten thrown out of a Chinese Art collector's house and Qwill, doing a column on the collection, finds her in the weeds and adopts her too. Each story contains at least one murder puzzle for Koko. The cat seems able to pick words out of the dictionary, read book titles related to the crimes, play 3-4 bars of relevant music on the piano in order to give Qwill some clues, and act out murders with Yum Yum. 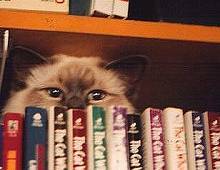 The Cat Who books are fun as well as interesting. They often contain human-interest stories woven among the mysteries and educational material regarding history, art, entertainment, and food. Some can stand as historical fiction that will increase students' understand of certain eras in the Midwest and Southeast. Crime themes involve a range of motives and methods for murder, including the more modernly visible stalking, domestic abuse, and business related espionage. The first three books are exciting and many in the later series (post 1986) are energetic as well, with a few near the end falling into genre more resembling the cozy. I have read the first three novels from the 1960s more than once and a few others several times: The Cat Who Lived High, The Cat Who Moved a Mountain, The Cat Who Said Cheese, and some others. Many fans of Ms Braun books wish the characters were real. In fact, some readers equate many of the characters with people in their own hometowns, before the world was changed forever by the Internet. Many of us would appreciate some of the stories being produced as films. Ronald Frobnitz to James MacIntosh Qwilleran http:/home.att.net/~RACapowski/index.htm. Many supposedly Cat Who web sites call for members, but most are gossip boards that focus on unrelated topics. This one is all about Koko, Yum Yum, and Qwill and has been operational for several years. See also: Lilian Jackson Braun book pages (bibliography and reading order) Search Festivale for work by Lilian Jackson Braun.